Planning and executing a successful crowdfunding campaign can be daunting. You need a compelling promo video, inviting graphics, simple yet informative communications, an engaging email strategy, and stand-out social media. Don’t panic: all this is achievable even without a budget or in-house expertise. This webinar will teach you how to harness the expertise of marketing, graphic design, videography, and communications professionals who want to volunteer to help your cause. In short, you’ll have access to the pro bono expertise you need to build a successful crowdfunding campaign from start to finish. 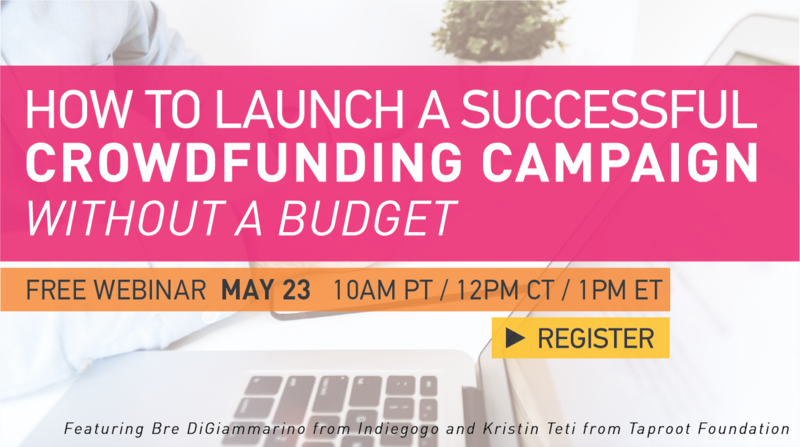 This free webinar is hosted by Bre DiGiammarino from Indiegogo and Kristin Teti from Taproot Foundation.